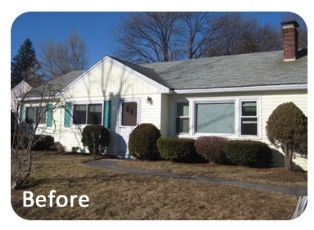 These homeowners in Natick, MA lamented that their house was the worst looking in the neighborhood. They were considering all options for new siding including Vinyl Siding and Hardiplank Fiber cement. Being a siding contractor in Natick MA, we're coming across this scenario a lot. They fell in love with Everlast both the actual siding product and warranty. We stripped the existing vinyl siding, installed new house wrap and new Everlast composite siding in the Misty Taupe color. We also installed new PVC coil and new trim.